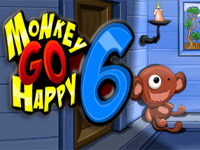 Monkey Go Happy Marathon 4 is the fourth version in this entertaining click-to-play series of puzzle games. The object of the game is to cheer up your sad little monkey by completing each of the 36 tricky puzzles. When you complete a level, your monkey will do a funny happy dance to show you how happy he is! Do you have what it takes? Level 1 – The Jigsaw Puzzle – Your monkey wanted to put together a jigsaw puzzle, but he’s sad he can’t figure out how to complete it. Make your monkey happy again by helping him put together the jigsaw puzzle until it resembles a beautiful flower! Level 2 – Connect-the-dots – Your monkey decided she wanted to complete a connect-the-dots activity! She’s sad though, because she doesn’t know where a pencil is, and can’t remember the correct order of the alphabet. Help your monkey find the pencil hidden in the room and connect the dots in alphabetical order to complete the picture and make your monkey happy again! Level 3 – The Trivia Game – Your monkey is in a trivia contest on television, and is sad because she doesn’t know all of the answers! Help your monkey answer the 10 trivia questions correctly to make her happy again! We don’t want to give away all of the levels to you, so you will just have to play Monkey Go Happy Marathon 4 for yourself to find out what the other levels are! 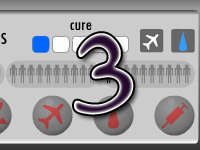 However, we will tell you this – Level 36 is the most difficult level of them all. Unlike the previous Monkey Go Happy Marathon games, in the last level, you need to complete all 3 parts 3 times each! Think you have what it takes to beat this difficult challenge three times?! Walkthrough videos and cheat sheets are available for Monkey Go Happy Marathon 4. You can Google search “Monkey Go Happy Marathon 4 Walkthrough” to find step by step articles on how to complete each level of the game. Additionally, you can google search “Monkey Go Happy Marathon 4 Videos” to find video walkthroughs available on YouTube to show you exactly how to complete each puzzle. I persoanlly like playing games without using any cheats, it’s more challenging. But I have to admit that there are some games like vex that made me look for those “walkthrough videos” I was talking about. Some Vex levels are so hard, so I had 2 options : cheat or admit that I am a loser. Guess what I did ! If your computer’s video card or internet connection is poor, it is recommended to use either the low or medium graphics quality options for a better gaming experience, and to experience less lag during the game. You can fully customize the appearance of your monkey. There are several options you can choose to make your monkey look the way you want! Your computer system needs to have the latest version of Adobe Flash Player in order to play Monkey Go Happy Marathon 4.